Where do we advertise your jobs? All our Total Job adverts are featured so that the advert stands out in the search results and increases your click through rate. Get more from Monster with their Career Network adverts included in all our packages. The adverts run for a full 30 days. Advertise a job on our premium package and have your vacancy showcased on Reed.co.uk, the advert will run for a full six weeks. Our adverts on Jobsite are also featured across their site and network for 42 days, giving you more reason to post with us. Showcase your job vacancy on CV Library for 28 days and have up to 10 matching CV’s sent to you straight away. We work with over 100+ job boards, social media and vacancy platforms to ensure your job gets maximum exposure. Any sector, any job from just £95 or less! 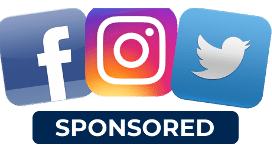 We sponsor your job across social media. Have your job advertised to relevant candidates in your area across multiple social media platforms including Instagram, Facebook and Twitter. Have your job found first. Google has now released their jobs results, allowing you to list your vacancy directly on the search results. Get found on Google first with Post My Job, included in every package.